Flexsteel upholstered home furniture limited warranties apply to the original purchaser for the specified periods of time (see above), beginning the date the product is purchased from an authorized Flexsteel retailer in the United States or Canada. Flexsteel products used under normal, indoor residential conditions are warranted against manufacturing and material defects for as long as the product remains in the original upholstery and for as long as parts are available. Slight softening and flattening of seat cushion foam and fibers as a result of normal use and aging Under normal use and conditions, cushions may lose up to one inch of the original height standard of the cushion foam core within the first year of use. These warranties do not apply to Flexsteel upholstered furniture purchased from an authorized Flexsteel retailer outside the United States or Canada. Flexsteel bedroom, dining, home office, and occasional furniture limited warranties apply to the original purchaser for the specified periods of time (see above), beginning the date the product is purchased from an authorized Flexsteel retailer. Flexsteel products used under normal, indoor residential conditions are warranted against manufacturing and material defects for as long as the product remains in the original upholstery and for as long as parts are available. The natural darkening of wood finish or the contraction, expansion, or other changes of wood materials resulting from variations in temperature or moisture. Rusting or tarnishing of metal materials resulting from abrasive scratches. Stains or changes in color or texture of marble and stone materials. Small air bubbles, surface waviness, or light pitting on glass and mirror materials. Knots, mineral streaks and deposits, and pitch pockets in wood and variations in wood grain and color. Wood is a natural material, and these are normal characteristics that enhance its beauty. Differences in and changes to grain patterns, colors, and hues and the splitting and cracking of mahogany wood over time. These are normal, desirable characteristics of mahogany wood that do not affect its durability. Variations in color, shading, texture, and veining of marble and stones. These are normal characteristics that enhance the beauty of these materials. Use anti-tipping devices to prevent furniture from tipping and injuring young children or pets. Avoid sitting on glass surfaces to prevent possible injury. These warranties do not apply to upholstered furniture. 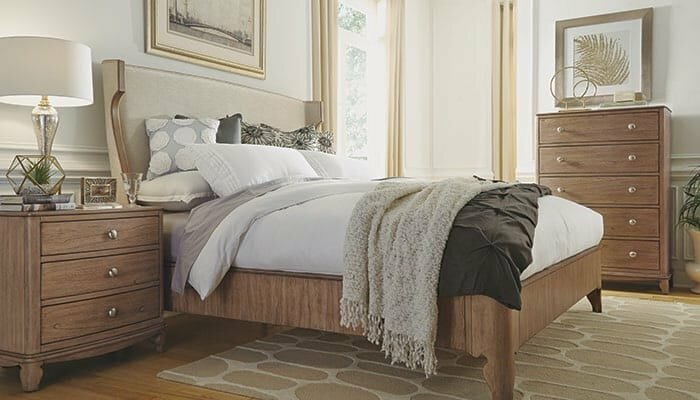 Each piece of Flexsteel furniture is crafted to bring years of beauty to your home. To ensure that your furniture stays looking beautiful, we suggest the following tips for cleaning and maintenance. Do not expose wood furniture to extreme heat or humid conditions. Do not place your furniture in direct sunlight or in a damp area. Avoid arranging your furniture so that it is placed in front of or over heating and air conditioning vents. Do not place plastic, rubber, or hot objects on your wood furniture. Chemicals in such objects may soften or discolor the finish. To avoid such damage, apply a strip of felt, leather, or cork under accessories. Also, occasionally rotate accessories so they do not remain in the same spot for extended periods of time. Lift objects from the top surface rather than dragging them across the finish when moving them. Use a protective pad when using your furniture as a writing surface (especially when using a ballpoint pen). Small scratches that occur with normal use can be touched up with a scratch remover or special touch-up pens or sticks available at your furniture dealer or at many paint stores. Dust frequently with a clean dry, lint-free cloth. For a more thorough cleaning, the furniture may be washed with a mild soap and warm water. Dry thoroughly using a clean, lint-free cloth and wipe with the grain. A furniture polish may be applied for more shine. We recommend this type of cleaning every six months to remove accumulated dust and furniture wax buildup. Do not use water, alcohol, lacquer thinner, acetone, or any alcohol-based cleaning products. Spilled liquids should be wiped from the surface immediately with a soft, damp cloth. Always wipe the furniture in the direction of the wood grain. Vacuum with a soft brush to remove dust; hard-bristle brushes will mar the surface. Wipe the surface with furniture polish and a soft, dry cloth for regular surface cleaning. Do not use alcohol, lacquer thinner, acetone, or any alcohol-based cleaning products. Spills should immediately be blotted with a dry cloth. Use a lightly water-dampened cloth to remove any residue; then dry with a soft cloth and apply furniture polish. Do not use water, alcohol, lacquer thinner, acetone, mineral spirits or any alcohol-based cleaning products. Dust regularly with furniture polish and a soft cloth or chamois. Wipe the surface with glass cleaner and a soft cloth to remove dust, spills, or fingerprints. Do not place hot items (e.g., pans, dishes, irons) directly on this surface.